Back in December I decided that I was craving soft pretzels. Now I get pretty picky when it comes to soft pretzels and a lot of the ones out there just don't cut it. I'm seriously obsessed with Auntie Anne's soft pretzels and eat as many as humanly possible when I'm visiting the United States, but all other times... I get nothing. It's sad. We need a good pretzel place in Edmonton. But now I'm off topic, lets get back to the story. In December my craving for soft pretzels was undeniable, so I decided it was time to make some of my own. I looked over a ton of different recipes for pretzels and didn't exactly find one I felt was right. And then it hit me - why not make my own version? So I spent an afternoon making pretzels and had my family taste test them. I made exactly 12 pretzels for a household of 4, and they were all gone within 12 hours. And I only ate one. What? Seeing as it was unfair, I made another batch so I could eat some. Then I got sabotaged by my father 'cause he decided I needed to make millions of them so that he could give them away as Christmas gifts for our family friends. Long story short? These pretzels are really good. I've been getting lots of questions about the pretzels, especially after posting a picture of them up on Instagram. So here it is folks, the long awaited recipe. Enjoy! 1. Warm up the milk to about 110'F - it should be warm but not hot. Stir in the yeast and let sit for 5 minutes. 2. Add in the brown sugar and melted butter, stirring until thoroughly mixed. 3. Add in the flour and salt, combining the mixture together. 4. Knead by hand for approximately 10 minutes on a lightly floured surface. The mixture will be sticky, but should not stick to the surface you are kneading on. If it is, you may need some additional flour. 5. Place dough into a greased bowl, covering with greased syran wrap. Allow the dough to rise in a warm place for 1 hour. 7. Take the risen dough and punch it down slightly. 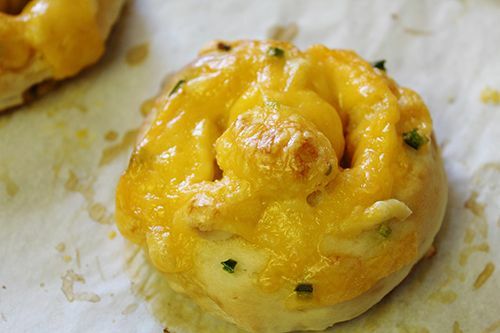 Split the dough into quarters. From each quarter, further divide the dough into 3 portions. This should give you twelve balls of dough. 8. Take one ball and roll the dough into a long, thin rope. Make a pretzel shape with the rope, and while preserving the shape, dip it into the baking soda water. Place the pretzel onto a parchment lined baking sheet. Repeat for the remaining 11 dough balls, placing the formed pretzels 1.5 - 2 inches from one another (I like to do 6 pretzels/baking sheet). 9. If you want plain pretzels, sprinkle the tops with some sea salt and proceed to step 11. 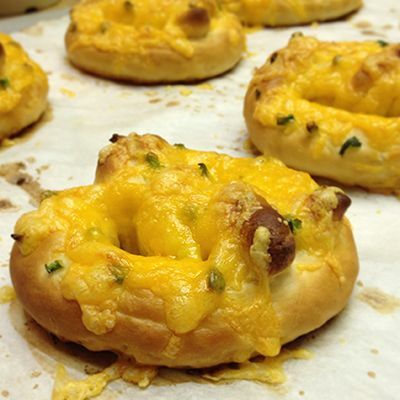 If you want jalapeno & cheddar pretzels, proceed to step 10. 10. Lightly embed pieces of chopped jalapeno pepper into the pretzels, ensuring that they will not fall off. 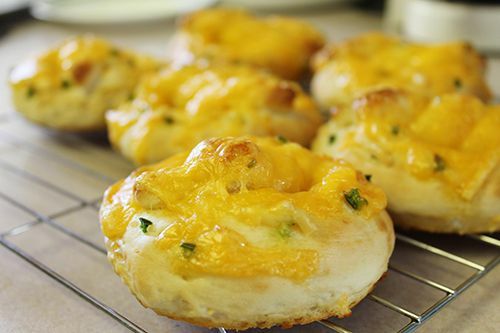 Sprinkle with cheese to your liking, but don't be stingy! 11. 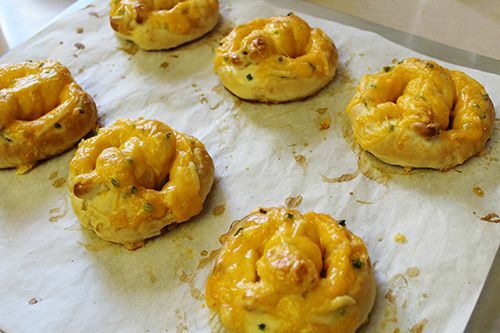 Place pretzels into the preheated oven for 8-10 minutes, removing when golden brown or the cheese is bubbling away. Allow to cool slightly before eating - enjoy! Best baked & eaten within the same day. I don't know about you, but in the winter all I want to eat is food in broth. It warms me up and is my go-to comfort food. One of the things I love eating within that category is hot pot - the ultimate food in broth experience. This past year so many different hot pot restaurants have opened up in Edmonton that it's hard to decide where to dine. 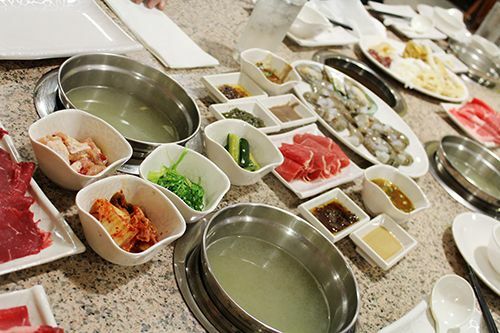 Last month, 97 Hot Pot was added to the lineup of hot pot restaurants with an all you can eat (AYCE) concept. 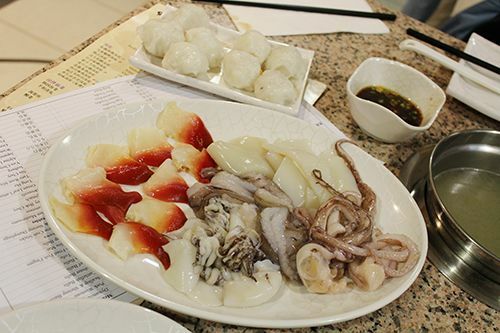 For $25.95 per adult and $12.95 per child (3-9 years old) the prices are comparable to other hot pot restaurants in the city. I went out for dinner with my family on a cold Sunday night and the place was packed. Maybe their neon signage outfront really works to attract customers? For those unfamiliar with the area, the building for the restaurant used to be an Asian grocery store. Needless to say, extensive renovations have been made and each table is armed with induction cook tops to allow every customer to have their own individual pot. At 97 Hot Pot, there is the option to have a flavoured soup base for $2 (chicken broth is free of charge). 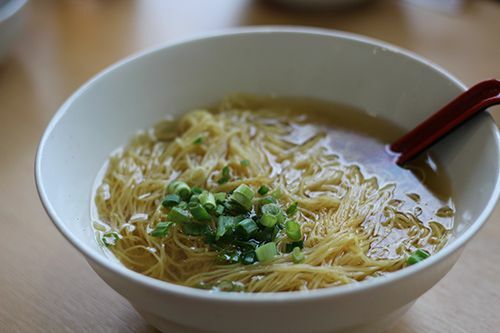 They've got a wide range of soup options and the individual cooking style is perfect when you and your dining companions like different flavours to your broth. I personally enjoy the regular chicken broth and choose to season my food with a combination of sauces for just the right flavour. Their sauce station is equally as impressive, with about 20 different options you can mix together to find your perfect flavour. I honestly think their selection is the best in the city, given that they have just about everything I could think of to offer! At the table each person had adequate space and their own induction cook top for their pot. Each person was provided with a bowl, two plates, chopsticks and a mini ladle to eat with. The dishware that evening was very clean and featured a geometric pattern - but this might not last for long given that design will likely wear off. We were supplied one ordering sheet to write on for the table with about 100 items separated into different categories. 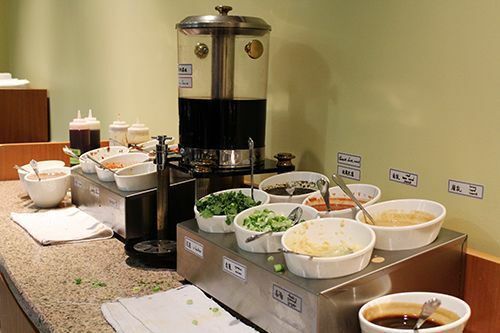 Cold side dishes (pickled veg like cucumbers and kimchi) and appetizers (green onion cakes, spring rolls and edamame to name a few) are included and great to munch on while you wait for the raw food. I appreciated that there was a wide variety of food to order and everything was included in the price. Other hot pot establishments like King's Hot Pot and Urban Shabu charge extra money for certain items, so I was glad to see that we didn't have to pay extra for some of our favourite items (take enoki mushrooms and surf clams for example). And there's no limit to how many of each item you can order! My parents were pretty happy that they could have more than 2 oysters each. Of all the items we ordered that evening, we really enjoyed the housemade meat/seafood "mashes" (shown below). They're basically different varieties of meat ground and seasoned so that you can form your own meatballs at the table. All the food that we ordered was fresh (especially the seafood!) and we were more than satisfied at the end of the meal. My aunt & uncle both ordered a flavoured broth, and felt that the flavours were watered down - so perhaps stay away from the additional soup bases. Saves you $2 too! 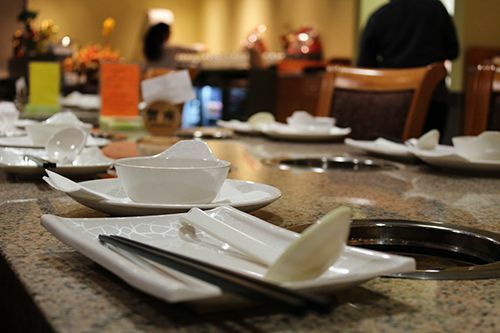 At the end of the meal you also get complimentary dessert, and 97 Hot Pot offers up four kinds: osmanthus cake, daily tong shui (sweet soup), dessert tofu and ice cream. Of course I went with the ice cream, as I can't say no to anything mango! One thing I should mention is their ordering system - when you order items that can be counted individually (like fishballs, meatballs, mushrooms, etc.) you write down the exact number that you want. With items that are harder to count individually (slices of meat, leafy vegetables, tripe, etc.) they have a set portion size, and the number you write down indicates the number of portions. A little confusing, but not hard to figure out. I think it's pretty evident that I had a great night and have nothing but nice things to say about 97 Hot Pot. At least when it comes to the food anyway. Good service in these establishments is pretty hard to come by, and it is the same here at 97 Hot Pot. There aren't many servers so it can be hard to get someone's attention. The nice thing about it though is that there is a call bell at each table - if you need something, hit the button and the staff are notified that you're waiting for something. It's a temporary solution but nothing can replace the presence of another server working. Aside from this, I definitely recommend stopping by 97 Hot Pot for a delicious hot pot experience. I like that the workers and management do treat customers with respect and give you the best service they can. There's many hot pot restaurants in the city that don't necessarily adhere to giving the customer what they want. 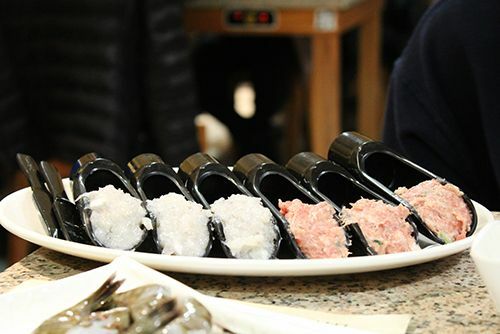 Restaurants like Urban Shabu and King's are well known (in the Asian community) for limiting your food - like "forgetting" your order of seafood, or "accidentally" giving you too much of a filler item that is inexpensive (like rice cakes or other starchy foods to fill you up quicker). Shady business, I tell ya. I'm going to go out on a limb and say that 97 Hot Pot is my top hot pot restaurant in the city. Great variety of food, nice selection of sauces and a price tag of $25.95 which is average for hot pot in Edmonton. Go check them out on a cold night - but don't forget to make a reservation first! Consider yourself warned. 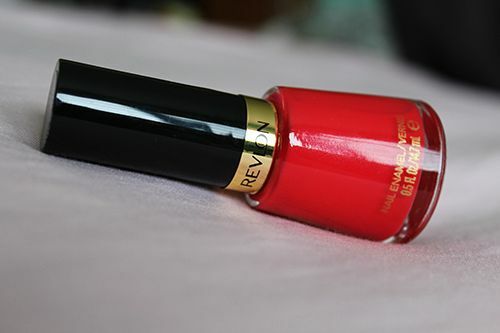 Click here to check out Linda's review as well! 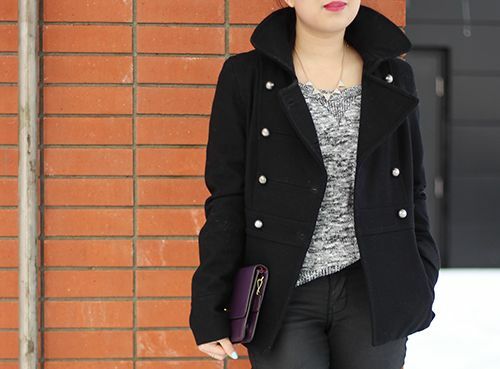 Dressing for winter weather can be tough. 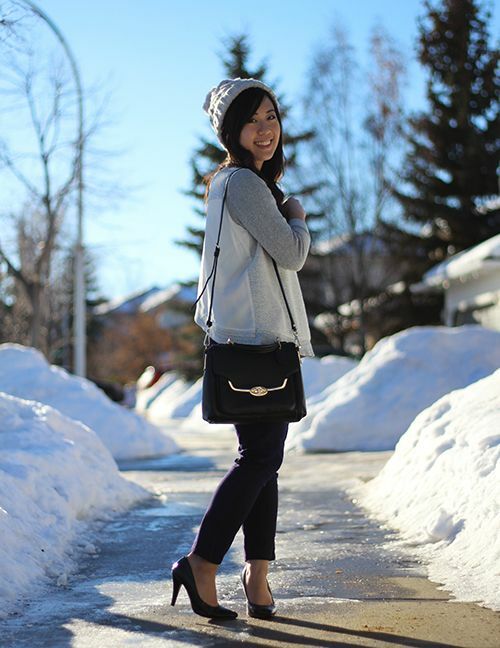 It can be considered an accomplishment in itself if you can stay warm and look stylish in the frigid Edmonton temperatures! 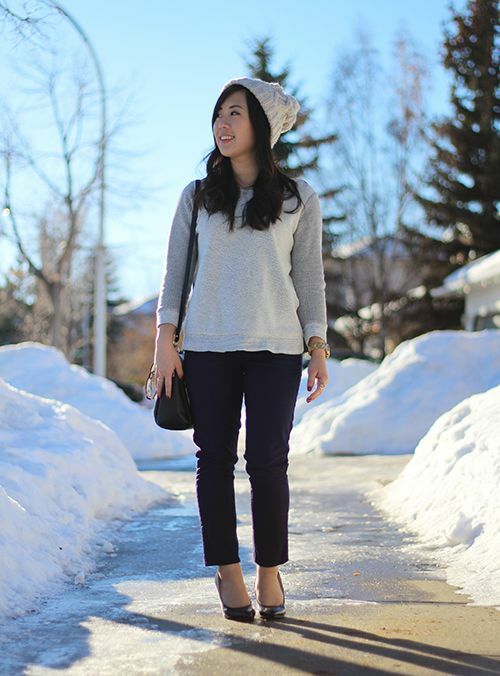 This season, my favourite winter items have been knit sweaters and my trusty heeled ankle boots. 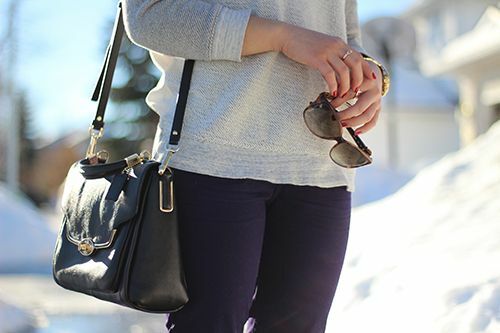 Sweaters are so comfortable (when they're not itchy), and when paired with ankle boots you just get a comfy, chic vibe. 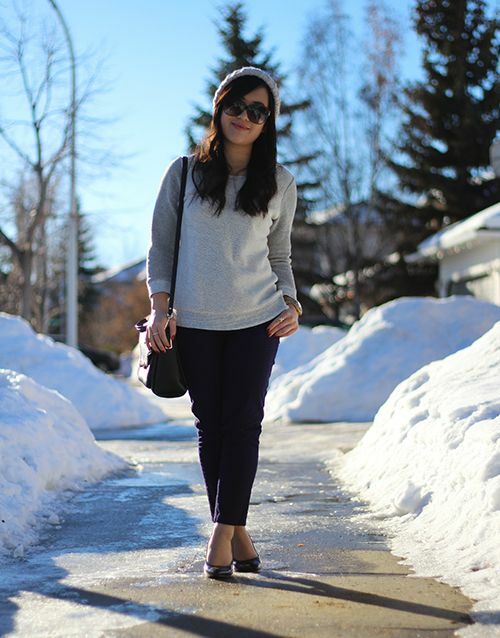 Yesterday I was featured in the Edmonton Journal (my local newspaper) talking winter trends and my fashion tips for cold weather. 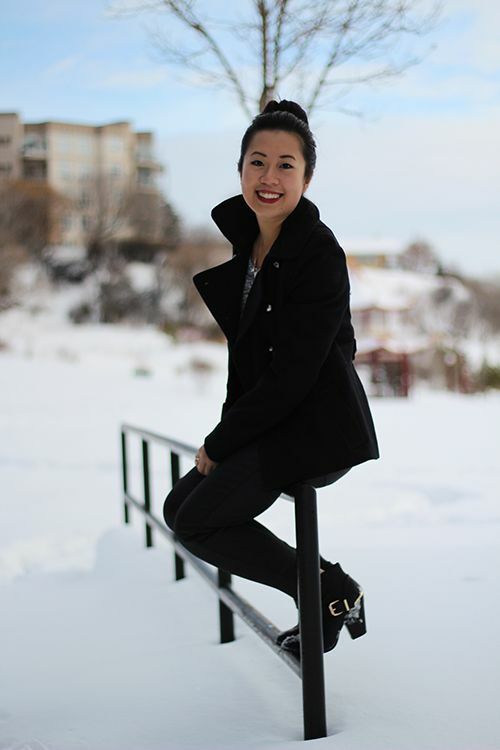 Being interviewed, photographed, and published in a newspaper has been such an exciting experience, and you can read the full article here *click*. Because of this, I just want to take a couple moments to say thank you to each and every person that clicks and reads this blog. I know I don't say thank you enough, but I am so appreciative of all the kind words, support, and love from everyone who has been part of this blogging adventure with me. Without you, I wouldn't be here today. I never envisioned for this blog to go anywhere and it's such an amazing feeling to be able to connect with so many people. Even if you're a silent reader, I have to say thank you for all that you do to support my work. Leave me a comment below, I'd love to get to know you! So thank you again for everything. I owe it to you guys. There has been an influx of new restaurants in Edmonton over the past few months and there are still a few on my radar that I'm anticipating at the beginning of this year. One of the restaurants I've been looking forward to is The Glass Monkey, but I feel like it has been flying under the radar. Not much has been said, and not much has been heard - so I was really curious to see what the restaurant was all about. This past weekend I surprised my boyfriend with dinner at The Glass Monkey. We arrived at 6:30 on a Saturday night at the restaurant was packed. This was actually quite shocking for me to see, as it is a relatively new restaurant and there hasn't been much hype for it. Being located in a residential area must be the key - our server told us that a lot of their patrons live in the immediate vicinity. The space formerly occupied by Jack's Grill has gone through lots of renovations and the atmosphere is quite different. Clientele for the restaurant ranges from young adults to older couples, and The Glass Monkey's extensive wine and beer list (+ Q Water) makes any occasion appropriate for a meal here. Calling themselves a gastropub, The Glass Monkey promises high quality pub food in the form of tapas, small plates and full sized meals. A menu is provided at every seat in the restaurant and all the items are categorized differently. Snacks, boards, small plates, pizzas, large plates, salad, pasta and desserts - they cover a wide range of dishes and there definitely is something for everyone on the menu. Many items on the menu are made in house, including the pastas, pizza doughs and charcuterie. Upon hearing this, it definitely swayed my decision on what to order for the night. 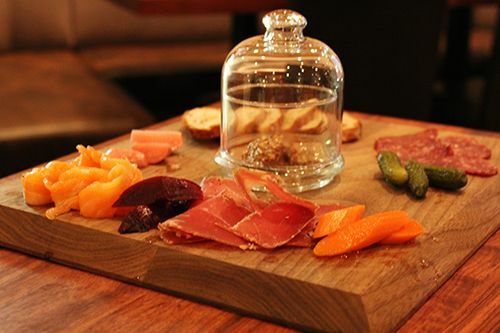 Our meal started off with the Charcuterie Board ($18): daily selection, crostini, house pickles. The selection for the day included the housemade smoked salmon, prosciutto and venison salami alongside pickled beets, radish, carrots, gherkins and crostini. What's in the middle you ask? Grainy mustard in its own serving vessel. The salmon had a light smokiness and smooth texture while the prosciutto was drier than what you typically expect. However, the prosciutto wasn't overly salty, and I didn't mind the thicker cut. The salami on the other hand was my favourite of the three as it was flavoured with a great combination of spices to combat the gaminess of the meat. Thanks to Charcut, I now love beet salads and always order them when I see them on a menu. 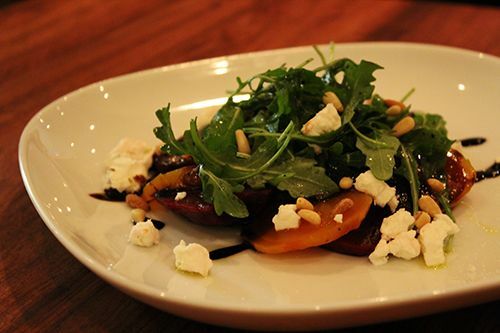 The Glass Monkey's version ($11) is comprised of: roasted beets, goat cheese, balsamic glaze, pine nuts & arugula, which is quite similar to the offerings at other restaurants. The beets were sweet and worked as a great palate cleanser,while the creamy goat cheese and baby arugula provided some contrasting textures and flavours. The ratio of cheese to greens worked well - I only wish there were more beets for me to eat! 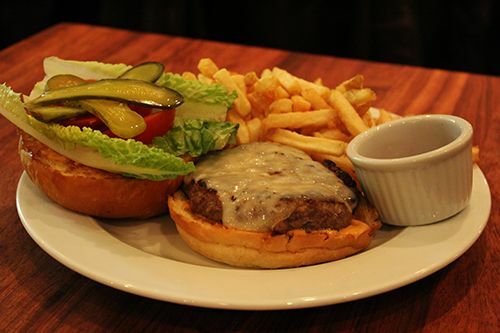 For mains, my boyfriend ordered the burger ($15): sirloin beef patty, Sylvan Star gouda & homemade fries. Upon ordering, our server actually inquired as to how he wanted the patty cooked and we went with medium rare to see what it would be like. It's very rare for a restaurant to be willing to cook a patty other than well done, so this was exciting. The burger came with all the usual fixins (romaine lettuce, tomatoes, pickles) and the burger was pillowy soft. Eaten altogether, the burger was seasoned well and had a little kick of heat to it. Seeing as it was cooked medium rare, the patty didn't hold itself together well and was a little difficult to eat. Aside from that, it was a great burger with a side of crispy fries. 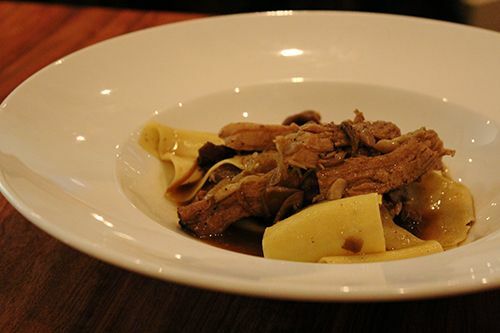 For myself, I had to try out the Home Made Pappardelle ($18): slow roasted pork shoulder, wild mushrooms. When it appeared at the table, I have to admit I was slightly disappointed since it looked like such a small, boring dish. However, the first bite into the pork made me take those feelings back. Each bite of pork was incredibly tender and juicy. There was a large portion of protein in the dish compared to the small amount of pappardelle (which was al dente and tasty, by the way), and the dish had been seasoned well. I was informed that Berkshire pork is slow roasted for 12 hours, pulled, and used in this dish. It was delicious and I would highly recommend it! 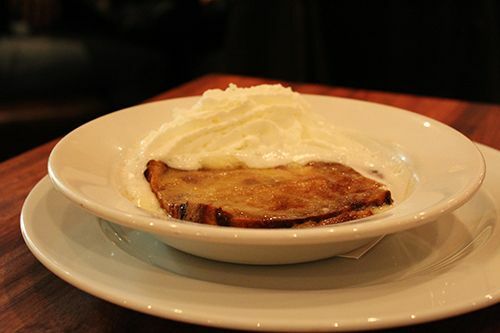 To round off the meal we ordered the classic Jack's Grill Bread Pudding ($9): caramelized rum sauce, whipped cream. The bread pudding itself was brought to our table steaming hot - the first bite actually almost burnt my tongue and made the whipped cream melt incredibly fast. The pudding was moist, but I found the sauce on top to make the dish a little too sweet for my liking. My boyfriend on the other hand really enjoyed it. As we dined we noticed that the restaurant was getting increasingly busy. Large groups were coming in and willing to wait for a table to open up, while others chose to forego formal dining and sat up at the bar. I couldn't believe how many people were coming into the restaurant! But because of this, service was compromised the evening of our dinner since there were not enough wait staff to accommodate diners. While our server was knowledgeable and pleasant, there were periods of time where we could not locate our server and we ended up dining for about 2.5 hours. 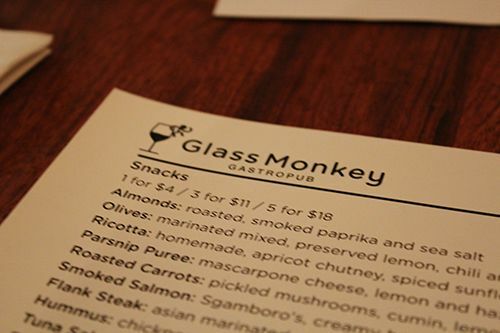 The Glass Monkey offered us a great evening of delicious food - not that I'm surprised, considering Chef Darcy Radies (of the Blue Pear) and Chef Bryan Meintzer (Jack's Grill, Blue Pear, The Marc) are behind the menu. With a great selection of dishes and a warm, inviting atmosphere, I can definitely see myself here many times in the near future. I had such a huge dilemma choosing my dinner options that my boyfriend already said we would be back soon as dinner was "excellent" (his own words, I promise!). I love that the restaurant environment is a mix of formal and casual so that it caters to every diner, and the prices are affordable. Stop by for drinks after work, make it a night out with your girlfriends, or stop by to celebrate a special occasion - whatever makes you happy. Just make sure to make a reservation before you stop by - it'll be tough to get a table if you don't! For about a week now I've had a crazy craving for sushi. 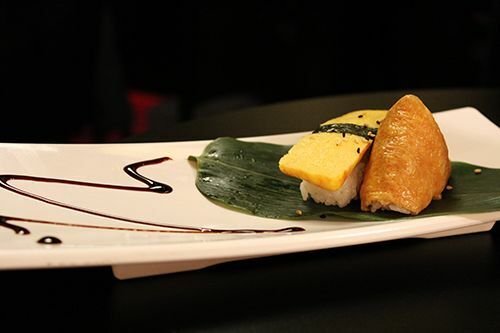 But if you know Edmonton, good sushi can be hard to find. In the summer my boyfriend and I visited B-Bim-Baab and noticed that their lounge was being converted into something new. Our server informed us that the restaurant was planning to open up a Japanese restaurant in the space. 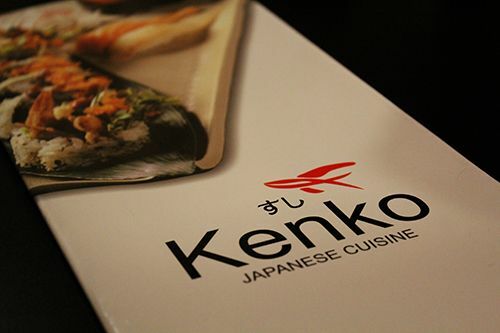 So last Saturday I met with a friend to try out Kenko, the name of the space that opened up inside the lounge. Unfortunately, the restaurant wasn't open for lunch so I was not able to fulfill that craving. Fast forward about a week, and the craving became so bad that it was time to brave the cold temperatures and falling snow for some sushi. Kenko can be a little hard to find as they have no signage up outside of the building, but when you see B Bim Baab you'll know you're in the right place. A friend and I arrived at about 7:30 on a Friday night and the parking lot was full. Seemed like everyone else was craving sushi just like we were. When we stepped inside, the Korean side of the restaurant was practically empty while all the patrons seemed to be seated inside Kenko. Browsing the menu was no easy task. It's a little overwhelming as there are lots of options. About half the menu is dedicated to maki (like Japonais Bistro), so that was what we decided to stick with when ordering. 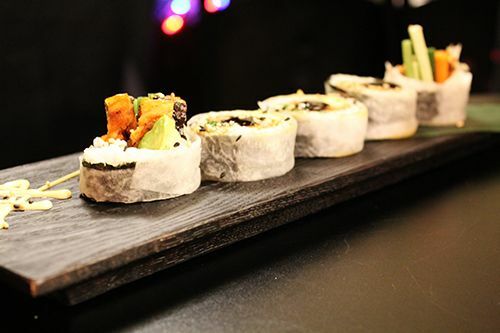 There are many interesting combinations, but many of the rolls have the same base ingredients: avocado, cucumber and imitation crab stick. It's not necessarily a bad thing, but those ingredients were prevalent enough for me to take notice. 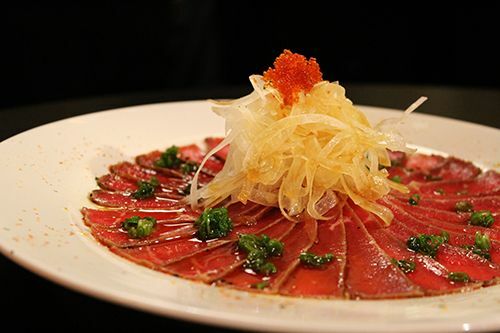 To start off our meal we ordered the Beef Tataki ($15.95): seared beef, green onion & sliced onion served with goma shabu and ponzu sauce. When the plate arrived at the table I was shocked at how large of a portion we were given. The beef was sliced extremely thin, onions were topped with tobiko (my fave!) and the ponzu sauce was drizzled onto the dish tableside. The ponzu sauce was quite unique, in that it was sweet and tangy. The sweetness was unlike any ponzu sauce I've ever had in the past and I quite enjoyed it. The accompanying sesame sauce was also a nice touch, complementing the tender beef very well. 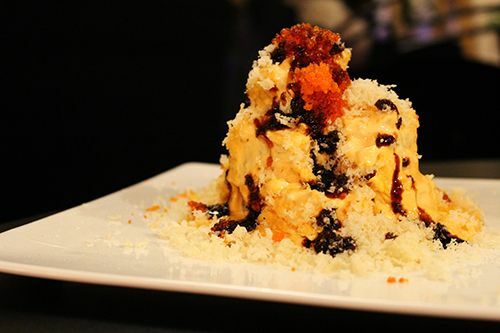 The first roll brought to the table was the Volcano Roll ($17.50, 8 pcs): avocado, tempura eel roll topped with chopped squid, tobiko spicy mayo sauce, special sauce and tempura crumbs. It sure looked like a volcano. This roll actually reminded me of the Love Crunch roll at Japonais Bistro due to the presence of panko. Each piece was a mix of sweet and spicy, and each bite had a certain creaminess to it. I loved the extra crunch from the crumbs and definitely recommend this one. Next to our table was the Master Roll ($15.95, 8 pcs): chopped scallop, cucumber, mayo, tobiko roll, topped with baked spicy mayo scallop, masago, furikake and special sauce. Surprisingly, it was very similar in sweet and spicy flavour to the volcano roll, but the crunch was replaced with chewy bits of scallop on top of each piece. 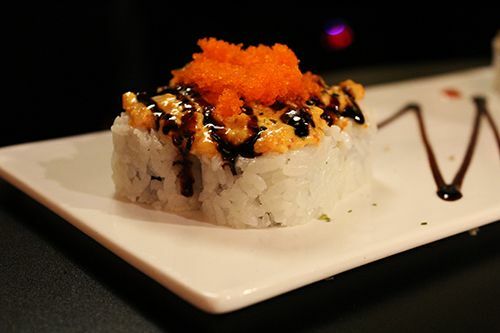 Each bite was creamy with crunchiness from the cucumber and delightful pops of tobiko. Last up was the Kawasaki ($13.95, 5 pcs): grilled salmon skin, yamagobo, avocado, cucumber, green onion, bonito flakes, sesame seeds and special sauce, wrapped with pickled radish crepe. I was actually quite excited for this roll since it would be different with the radish wrapping all the ingredients together. Unfortunately there was a hint of burnt tasting fish skin and otherwise it was pretty bland. In retrospect I probably should have gone for the White House Roll, which has many different types of seafood wrapped in a radish crepe. Next time! Overall, the meal at Kenko was wonderful. It was a busy night in the space, and despite having only two sushi chefs and one server the food was delicious and we didn't have to wait too long. Our server was very pleasant and efficient, allowing us to be in and out of the restaurant in under 1.5 hours. One thing I really enjoyed about the meal was the plating done with every dish. The chefs here put in a lot of effort, and it is clearly reflected in the food quality. Prices are on par or a little more expensive compared with most Japanese sushi restaurants in Edmonton, but I'm willing to pay the higher prices for better food. 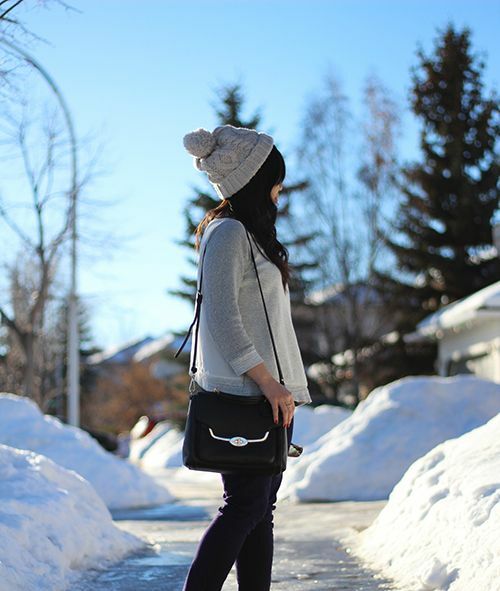 It's definitely a hidden gem on the south side of Edmonton - check them out if you're ever in the area! 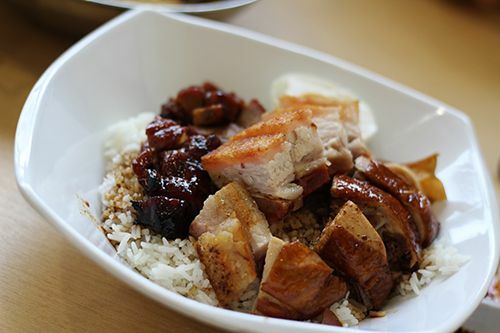 One of the things I miss the most about Hong Kong is the abundance of cafes serving up Asian comfort food. 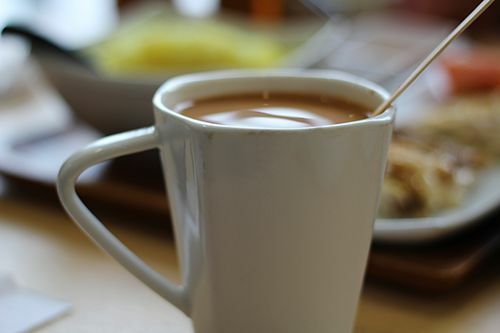 When I first heard that a new Hong Kong style cafe was opening up in the North side of Edmonton I got pretty excited. My parents were interested in checking out the cafe as well after hearing about some good experiences from their friends. This past Sunday afternoon we drove to the restaurant, and the long ride built up our anticipation for the meal. Arriving around 1 PM, the restaurant was still quite busy from the lunch rush. We were seated in the back corner of the restaurant in a small, cramped booth playing footsies with one another throughout the meal. The menu had a range of different dishes to order. Singaporean and Vietnamese influences were evident on the menu but we stuck with the classic dishes that we as a family know and enjoy. First up to the table were wontons & dumplings (shui gao) served with wonton noodles in soup (#g3, $7.50). Everyone has their personal preferences for wonton noodles but I like mine to be al dente with an elastic character to them. At Golden Bee, the noodles were just the way I expected, served up in a hot, steamy broth. Beneath the bed of noodles were 3 dumplings and 3 wontons, with both varieties being substantial in size. Next up was the Beef Brisket Curry (#n4, $12.95 - rice and soup/hot drink included) which was both the most randomly and messily plated dish of the meal. 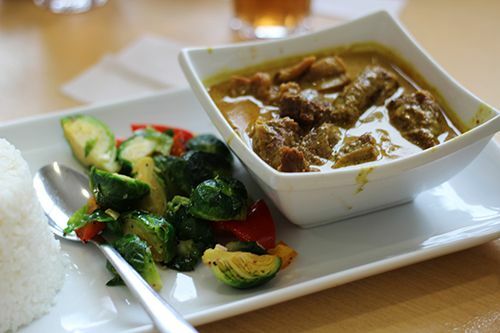 The reasoning behind stir fried brussels sprouts accompanying the dish is beyond me, but the curry tasted great. There was a substantial amount of brisket amongst the potatoes, all of which was seasoned well with a kick of heat. Another classic dish we ordered was the Beef Fried Ho Fan (#j30, $11.95 hot drink included). I like using this particular dish as a way to measure how well the kitchen can cook. 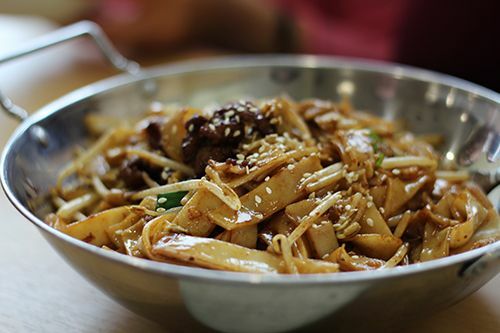 Traditionally, broad rice noodles are fried in a wok with beef, green onion & bean sprouts at a very high heat to achieve an almost burnt flavour, which us Chinese people like to call "wok hei," which literally translates to "wok air." It's silly, but this almost burnt flavour gives the dish its personality. The cooks in the kitchen here did a wonderful job. The dish was seasoned well, the noodles didn't stick together without being overly oily, and you guessed it - wok air! See wikipedia for a better explanation. 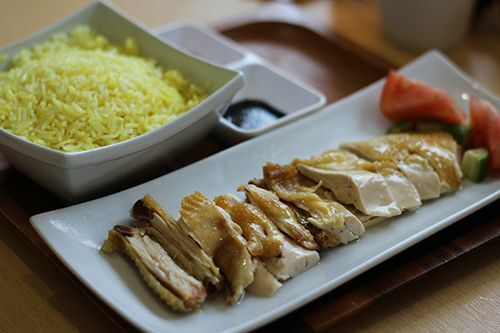 The Hainanese Style Chicken with Rice (#n1, $12.95 hot drink included) was a dish I was really looking forward to but was unfortunately let down. The dish that I've come to know has the rice cooked in fragrant chicken broth (or even chicken fat) with traces of ginger and green onion. The rice at Golden Bee was coloured with some tumeric and completely lacking in flavour. The chicken itself was also bland and it was presented in a small portion size, making this the most "expensive" dish on the table. The last dish to our meal was the BBQ 4 Item Combo on Rice (#m6, $11.95 with soup & veg included). Golden Bee makes their own barbequed meats, so we opted to try a variety of their offerings on a bed of rice. This is a classic grab & go type of meal that you'll find at any Chinese BBQ place, and I love how cheap it is. This dish came with Char Siu, BBQ pork with crackling, soy sauce marinated chicken, and half of a salted duck egg. All the meats were marinated and cooked well, and the crispy skin on the BBQ pork was delicious. The portion size was quite large for one person, so I'd suggest sharing this one. Maybe I'm being harsh, but I'm disappointed that the food at Golden Bee wasn't as good as I had anticipated. By Edmonton standards the food was what we consider acceptable, but portion sizes are small and the prices are expensive for what you're getting. The cramped seating in the restaurant doesn't provide the most comfortable dining experience, and with the wait staff being so busy all the time you're not getting the best service either. 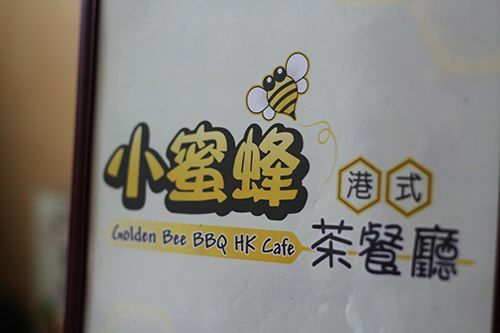 I surely wouldn't make the drive all the way to Golden Bee from the south end of the city where I live, but those living in the north end of the city must appreciate having some form of an HK style cafe. 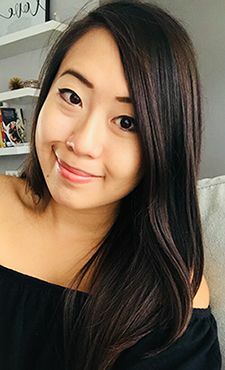 If I were in the area I may consider stopping by, but then again there are so many great Vietnamese options in the north end of the city that might just get my attention instead.